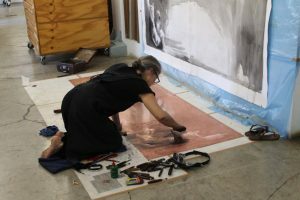 There has been a flurry of activity at DKW over the past two weeks. 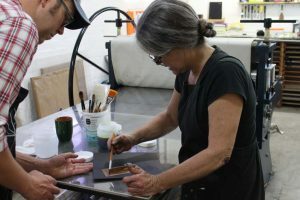 The American Master Printer Phil Sanders, visited the workshop to work with Jillian Ross and her team in collaboration with Deborah Bell on a new series of intaglio prints. 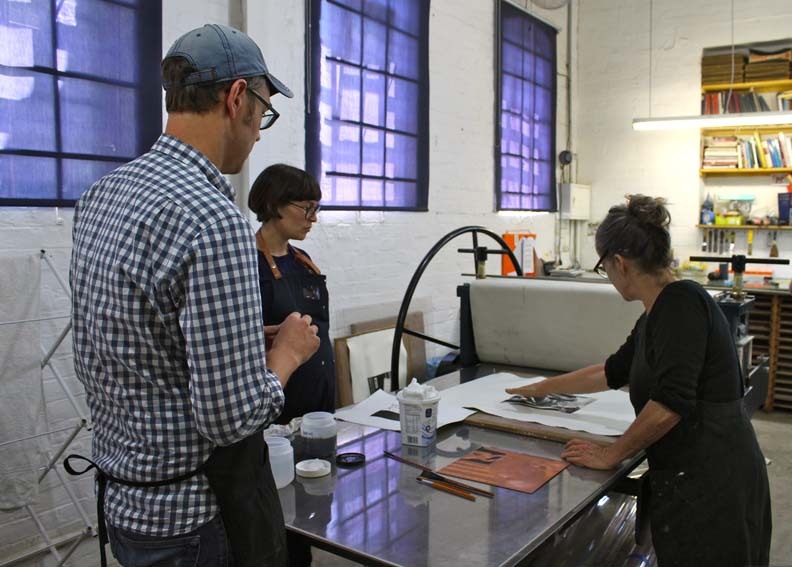 Deborah and Phil’s last visit to the studio was in 2014 where they worked on a series of etchings, one being the print Reveal. 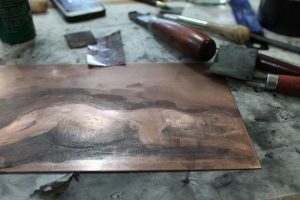 Two plates from this visit were set aside and have been revisited and developed into an exciting continuation of the series. 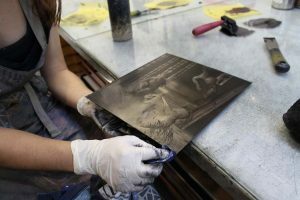 Deborah works with the techniques of dry point (working directly onto the plate with burnishers to work in light tones and roulettes and needles to bring in darker marks) as well as etching. 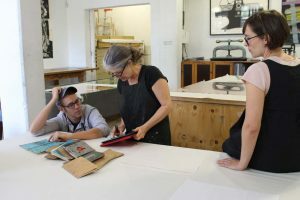 Phil and Jill with the assistance of the DKW team of printers Kim-Lee Loggenberg, Chad Cordeiro and Sbongiseni Khulu, facilitate the application of aquatints, softgrounds and the printing of proofs. 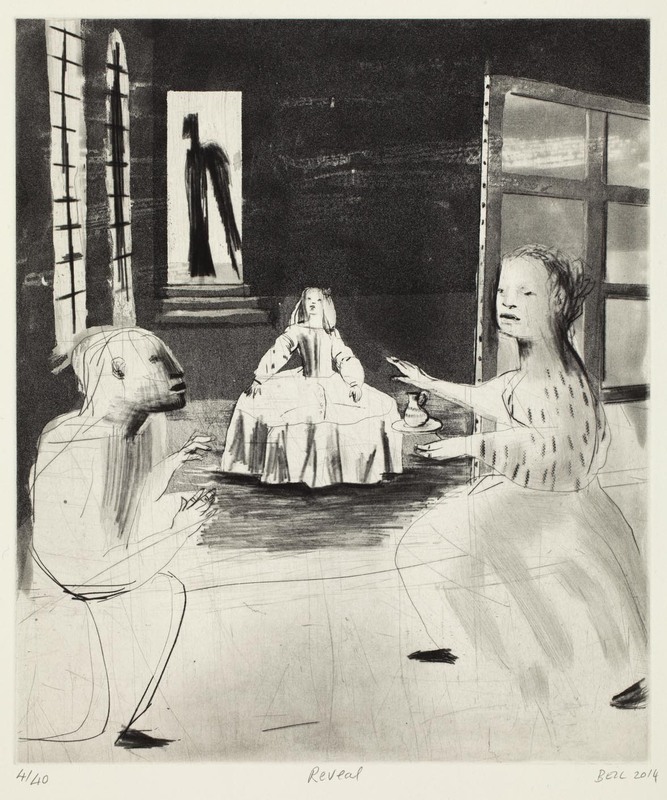 This series is part of an ongoing collaboration between David Krut Projects and Deborah Bell. Series launching soon.